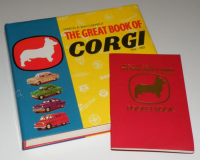 I've arranged this part of the site chronologically, using Marcel van Cleemput's Pocket Book companion to the wonderful & essential Great Book of Corgi as a guide. Each year gets its own page and on each of those pages I list all the new models released that year. If there's one I've had in my collection or through the web store there's a link to pictures of it, where I don't have one yet I'm open to offers if you have one for sale. Please browse and enjoy. You may make copies of anything on the site; all I ask in return is an acknowledgement and a link back to this website. (September 2018) This section of the Museum is having a make-over. Most of it was written in the early Noughties and looks like it. I'm going for a cleaner look more in line with the rest of the site and my on-line store. I've got lots more pictures now too so they are all getting a review and where possible poorer pictures are being replaced and gaps are getting filled in. I'm working backwards from 1983 as there were most gaps in the later sections. The Corgi Toys brand is launched by Mettoy with a fine range of British cars centre-stage supported by no less than 6 versions of the Bedford CA van. 1958 The year of the missiles - two competing systems Bloodhound & Corporal, very realistic and the beginning of the military models. 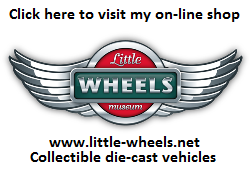 1970 Whizzwheels take over, working features begin to disappear. There are still some great new products but the decline has begun. 1972 Products sourced from Hong Kong, Whizzwheels models, no clever engineering, nothing worth much at all. 1973 More dumbed-down models and fewer recognisably 'Corgi' products, Nothing new, just rehashes of mediocre stuff. 1974 As last year, nothing new worth a mention. 1978 There was little new in 1978. 1979 The year of character merchandise - almost half the new releases are TV, comic & movie themed and most of the rest are rehashed old models. 1980 There were some decent models in 1980, some new and some were warmed-over products from previous years, the move to 1:36 scale is almost complete. 1982 Corgi are struggling to survive against the unstoppable rise of electronic games, they even attempt to bring in some electronics themselves, not very successfully. The products on offer have gone into a bit of decline now. 1983 This is where it all came to an end for Mettoy Playcraft Ltd. Mettoy had been founded in 1933 by German émigré Philip Ullmann and launched the Corgi Toys brand in 1956. In 1983 after a few years of indifferent trading the company went bust. The company was sold in 1984 with the assets of the company transferred to a new Corgi Toys company which folded shortly after.